Manuel Cortes, general secretary of the TSSA, joined members on the picket line at tube stations from 5am today and issued this message. I pay tribute to my members whose commitment to public service is so strong they are now prepared to forego a day’s pay today and strike if that’s what it takes to warn the public that the Tube is no longer being as as safely run as it was this time last year. The strength of feeling on this issue is reflected in the solidity of the strike with just a few trains are running at the edges of the system. London Underground may tell you today that they are offering 600 jobs this year, but the Tube sheds 400 jobs a year through natural wastage. In reality the offer is just 200 and whilst it’s a step in the right direction 200 jobs cannot plug the gaping hole that’s been left in the system by devastating Tory attacks on TfL’s budget. Tory chancellor George Osborne cut £700m from the central government operating grant to Transport for London in November 2015. 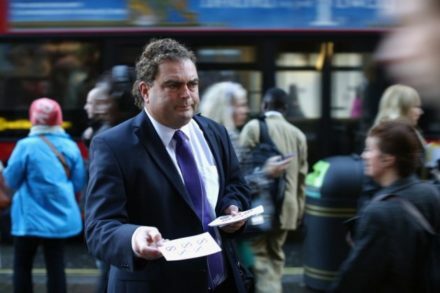 Tory Mayor Boris Johnson welcomed the cuts and within six months abolished 800 Tube jobs, closed ticket offices and the subsequent “new work practices” introduced under his regime have been so brutal they have led to a further exodus of staff from the service. The pair of them have heaped havoc on the Tube. And though Osborne and Johnson are gone from those offices, their damage is set to continue with another £1.4bn in cuts due by 2018. Put quite simply these level of cuts are not compatible with a safely run, properly staffed Tube and my members are now highly anxious about the impact this is having and will continue to have on their ability to keep you safe. . Our overtime ban of the last month has demonstrated effectively that there are no longer enough Tube staff employed employed to keep the networks 270 tube stations open. Too many stations are being been left open without staff, CCTV monitoring which protects against congestion has all but vanished, evacuation procedures are now insecure and the abolition of ticket offices have exposed our members to a sharp spike in levels of personal and physical abuse at work from increasingly frustrated passengers. No wonder they are fearful at work – there is much for them to be worried about. My members go to work every day proud to serve Londoners, proud to keep our city’s people transported. They are striking today to tell you that they can no longer transport you as safely as you, or they, would like and as safely as you were transported this time last year. They want safety standards ring-fenced as TfL faces a new round of cuts in the next year. They want central government to halt the abolition of the grant that will leave London the only major city in the world without a public transport subsidy. They need many more than the 200 jobs returned to the Tube if they are to keep four million commuters a day travelling safely. And they want me to thank the public for your solidarity as we fight this battle to preserve your right to Tube-travel with maximum safety. And of course our negotiating team available round the clock for talks with LU to resolve these matters.